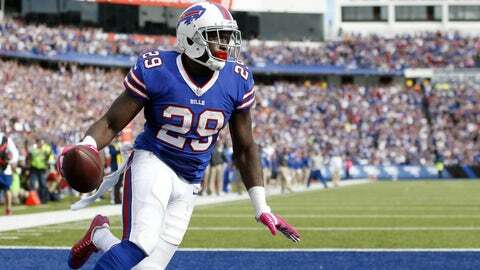 Karlos Williams is recovering from concussion symptoms, and Rex Ryan says it is unlikely that the running back will play on Sunday. Rex Ryan announced on Thursday that the Buffalo Bills will likely play on Sunday against the Tennessee Titans without second-string back Karlos Williams, who suffered a concussion in last weekend’s matchup with the New York Giants. According to Mike Rodak, Ryan said it was “a reach” for Williams to play, as the running back was still not practicing with the team on Thursday while going through the league’s concussion protocols. The Bills are already without star running back LeSean McCoy, who has a torn hamstring and could be out another three-four weeks, per Mike Garafolo of Foxsports. Perhaps even more impacting than McCoy’s absence will be Williams, should he remain sidelined for Sunday’s road game against the Titans. The rookie out of Florida State is averaging 5.4 yards on the ground and has scored a touchdown in each of the team’s first four games. Should Williams be unable to play in Week 5, then veteran Anthony “Boobie” Dixon will likely take the bulk of the work on Sunday. Dixon is a reliable back who has made a living out of being a jack of all trades. He’s played fullback, running back and has been a special-teams ace, and he should do a serviceable job in a pinch. That said, fantasy owners looking for points out of the Buffalo ground game in Week 5 might do better with quarterback Tyrod Taylor than any of the Bills running backs. Speaking of Taylor, the pressure is truly on his shoulders to find a way to get the offense going and avoid back-to-back losses.